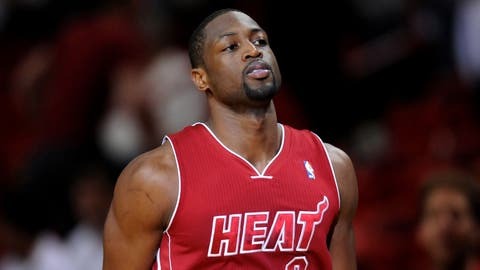 Guard Dwyane Wade is one of three Heat players who will not play against the Kings on Friday night. SACRAMENTO, Calif. (AP) — Dwyane Wade, Ray Allen and Chris Andersen are not playing for the Miami Heat at the Sacramento Kings. Heat coach Erik Spoelstra said before Friday night’s game that all three would be held out. He also said Roger Mason Jr. would start in Wade’s place. Wade has sat out at least one game of most back-to-back sets this season as the team hopes to keep his problematic knees healthy. Miami plays at Portland on Saturday night. Allen has been dealing with soreness in his knees, and Andersen has been coping with back and neck soreness that kept him out of the second half of Wednesday’s victory at the Los Angeles Lakers.